Roobinesque is sitting lower in the water, filled with enough food and fuel for 2 – 3 months. We’re heading for Flinders Island, north of Cape Melville, but we’re in no hurry to get there. 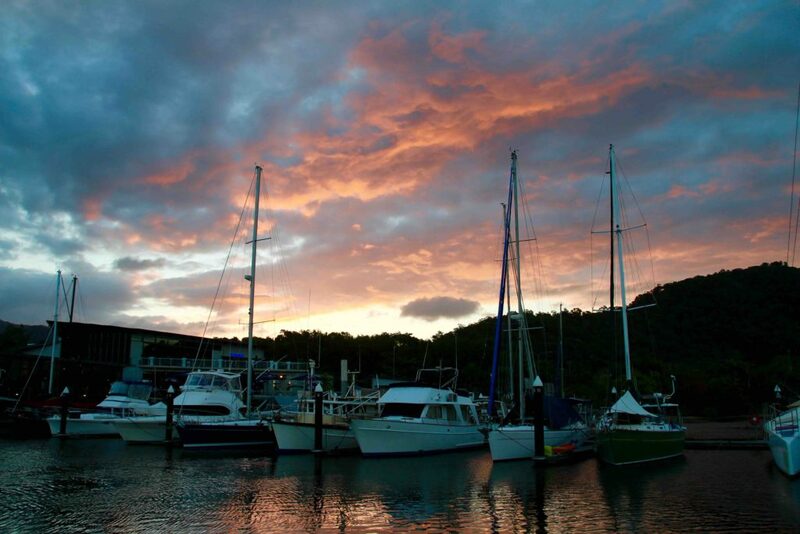 Tomorrow night we plan to anchor at Low Isles, east of Port Douglas. From then on we’re at the whim of the weather and open to suggestions – Lizard Island is definitely on the itinerary! We’re travelling in company with good friends, Wendy and Mark. They sail Temptress, another Lagoon 400, and it will be lovely to spend time with them on the journey. Sometimes the day’s sailing is about the destination. For the next month I hope it’s as much about the journey. We’ll be travelling through the Great Barrier Reef, past Cape Tribulation, Endeavour Reef (Capt Cook’s nemesis), Cooktown, Cape Flattery and along the magical ribbon reefs. I’ve looked down on this seascape for 18 years, flying for QantasLink, made countless PA’s describing it, and I’m finally going to see it up close and personal. I can’t wait! Telstra doesn’t have a strong presence up the Cape so there’s every chance we’ll disappear from social media for a while – even the aerial mounted up the mast won’t help! But we’ll post when we can and no doubt see many more beautiful sunsets. Look forward to sharing our adventures with you here and on Face Book. Blog Cooktown, Cruising, Discover Australia, Discover Queensland, Great Barrier Reef, Hachette Australia, Helene Young, Lizard Island, Northern Heat, Penguin Australia, Penguin Random House Australia, Port Douglas, Roobinesque, Safe Harbour, sailing. permalink. Bon Voyage and calm water all the way. Have a wonderful sail, Helene. That’s got to be my favourite part of the coast so far – Cairns to Cape York. Some beautiful anchorages – and nice protected ones too. Portland Roads springs to mind, the Flinders Group, Lizard Island of course – there’s so many! I found it much easier sailing that coast than coming further south. Escape River’s a good one if you get that far up, but it’s just around the corner from the Tip so maybe not this time. We had planned to sail the ribbon reefs but the winds weren’t in our favour that time. Looking forward to your photos! Happy travels, safe sailing. Really enjoy the photos especially the sunsets and sunrises so take lots. .